Human hair extensions has become very popular ways for many women to change their natural hair outlook. 100% human hair are all good hair? 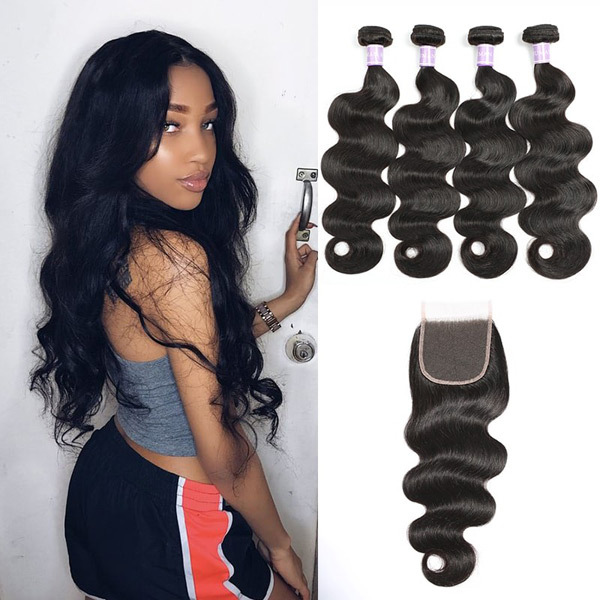 There are so many different varieties of quality when we shopping online, the most common terms used in hair extension terminology is Remy Hair, Non Remy Hair, Virgin Hair. Before buying the hair, do you know the difference between them? do you know which hair is high quality? Well, read this article you will get the answer. A good rule of thumb when shopping for hair extensions is that you should have a good understanding about its materials, where it was sourced and most of all, the process as to how the hair was collected before it hits the market. The term “REMY” is not a pretty woman’s name, It refers to the characteristics of the hair and the method used to manufacture the hair extensions. Remy hair is collected in a method in which holding the hair in a ponytail and cutting (top at top, and ends at ends) as it grew. This eliminates tangling problems commonly found in non-Remy or low quality hair. 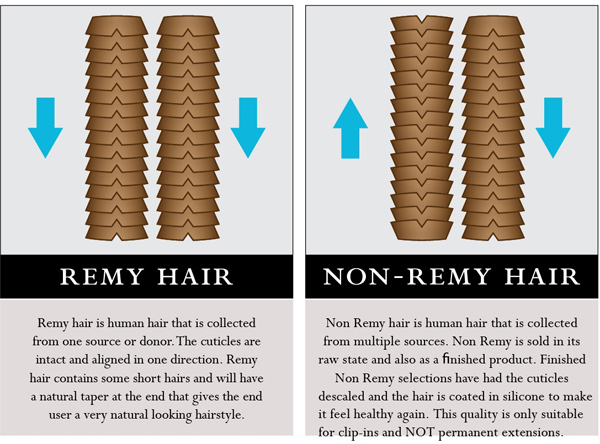 Remy hair is 100% human hair, all hair is full cuticle intact and aligning them in a unidirectional fashion creates extensions that are completely natural in appearance, which is not stripped. This cuticle will keep protein in the middle of hair fiber which makes hair fiber silky, soft thoughout its life time. It is easy for you to comb with your finger, special after washing it. Non–Remy hair is also 100% human hair, but it is collected or sorted randomly from different sources such as multiple hair suppliers, hair brushes and even salon floors. The direction of cuticles are mixed up, this makes the hair tangle and matte quite easily. Before non-remy hair hits the market, it goes through a process called acid bath to remove most of the cuticles. Now due to the high acid concentration, it decreases the hair’s natural moisture which results to straw like hair strands. To cover up this problem, the hair is then coated with silicon to help make it shiny and conceal any hair flaws or cuticle residues from the acid bath. At first glance the non-Remy hair will appear silky and shiny. After a few shampoos the silicone layer will start to wash off. The hair will slowly become duller, brittle and will tangle and matte very easily. This type of hair is not recommended for any long-term hair extensions for the obvious reasons. 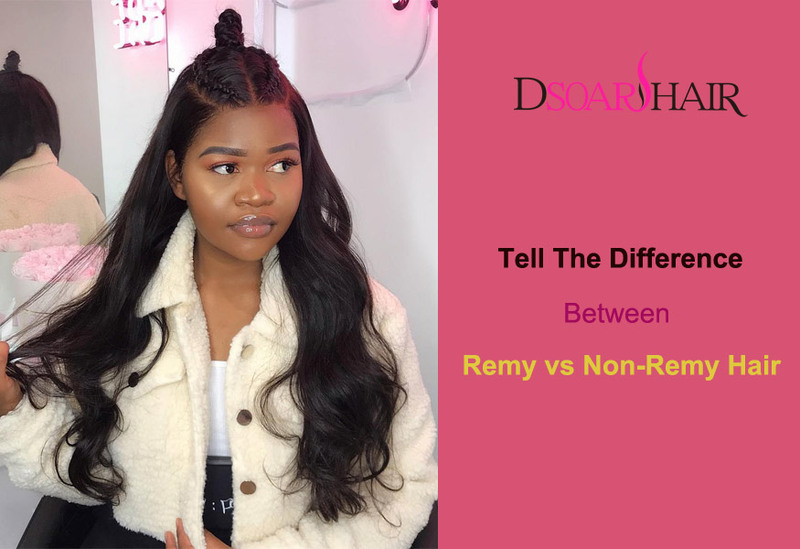 It is crucial to have a good understanding about the difference between Remy and Non-Remy hair. Quality hair weaves don’t come cheap, they are more of an investment. So it is best to do research before hitting that add to cart button just so you get the most out of your money. 1.In its simplest form, remy hair and non-remy hair differ in the way the hair is collected. Remy hair is bundled up or put in rubber bands before it is cut and collected. 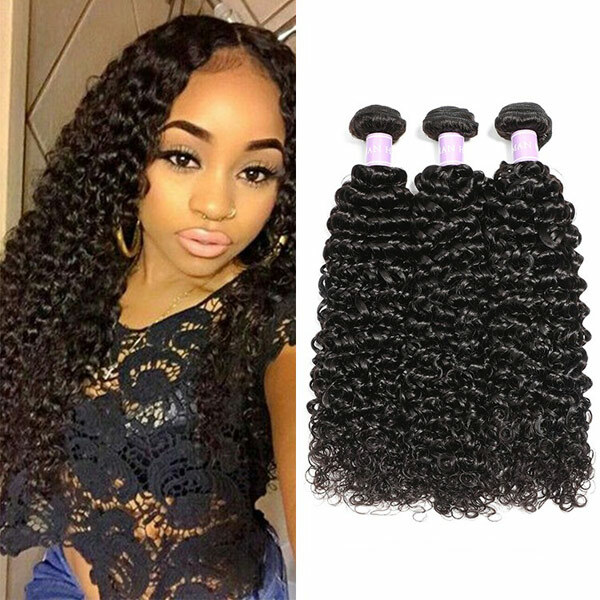 So all the hair of remy hair flows naturally from the same direction from root to the tip, the cuticles of the hair do not get roughed up as much and stay smooth, this is supposed to help with matting, especially in humid temperatures or after washing. Non-remy hair is hair that does not have it’s roots aligned (Roots and tips not traveling in the same direction). It is collected simply shear hair from the head, and put it in a bag without regard to the way the cuticle layers of the hair line up. Since the cuticle runs in both directions it requires a higher concentration of acid. Eventually resulting in hair with very low moisture, leading to dry straw-like hair. Non-remy hair-Because the cuticle runs in both directions, in order for Non-remy hair to be used in finished hair products, the cuticle has to be removed first. To remove the cuticle, the hair is soaked in large extremely corrosive acid baths which can damage hair permanently, it is unable to tolerate color treatment or heat. 3. Remy hair is expensive and looks more natural due to the tedious process that the hair goes through to not damage the cuticle. Non- Remy hair is readily available and is cheaper than remy human hair. 4. Remy hair lasts up to a year or more with proper care. Non-remy hair doesn’t last long and cannot be reused. One look at the appearance: It appearance with scales, but generally not too acid treatment, do not baking oil, appearance sometimes seem a little boring some bubble through multi-channel processing later, shiny appearance. Two touch: Touch the end from the beginning, very smooth, touch the head from the tail, some rough, generally smooth hair. After the bubble scales removed, no matter how you feel, basically do not tie a knot, it will look smooth, which is why the bubble are very popular reason to find a girlfriend a good first impression, often lasting go to a not much. Three feel: Feel oftness, feel its elasticity, feeling its wetness.